The key to success for any nonprofit executive lies in a skillful combination of six leadership styles and four management principles. For me it is still clear. It was the early eighties and I had just been recruited as the first executive director of the Hamilton Civic Hospitals Foundation. The foundation was in its infancy. Shortly after arriving, I was asked to present my vision to the hospital’s board of directors. Standing in front of the board that day, I had a pivotal experience. I realized I could not longer be just a manager interested in processes, but I had to present myself as a leader with a vision, a mission and strategy. It was at that moment I began to synchronize my management skills with my leadership skills and to continuously become a true leader. The hundreds of books available on leadership provide a great sweep of what leaders are and what they should be doing. Leaders are supposed to set strategy, motive, create a mission and build a culture. And, of course, the most important thing a leader should do is get results. There is also a less glamorous side of leadership, however – management. Management is the skillful handling of people and details to get results. To obtain these results, a manager must learn to synchronize leadership style and management methods. “Leadership” and “management” are often used interchangeably. It is, however, possible to be a very good manager without being a leader, or to be a leader who is not a particularly good manager. The synchronicity of these two roles has become vitally important and top organizations are demanding it. When hiring a new president for a nonprofit organization, board members typically look for people with passion, knowledge about fundraising techniques, strategic thinking and management skills, who are leaders in the community. Key factors in being a leader include creating vision and mission, developing the strategy to achieve these, and the ability to define one’s own identity within the equation. It takes the right people to build a solid team, but every team needs a good leader. The words and actions of the leader act as motivators. It is critical that the leader generate ideas and act as an agent of change. A leader teaches people how to think, not what to think, and must possess the core values that can hold together the ranks of the organization. The leader is the one who builds a culture of excellence. Ultimately, the most effective measure of a leader is the performance of the unit in his or her absence. It is often said that Canadians suffer from eternal niceness and that if we are to become excellent leaders and managers, we must learn to use different styles of leadership to get maximum results. Until recently there has been little quantitative research about which behaviours yield positive results. 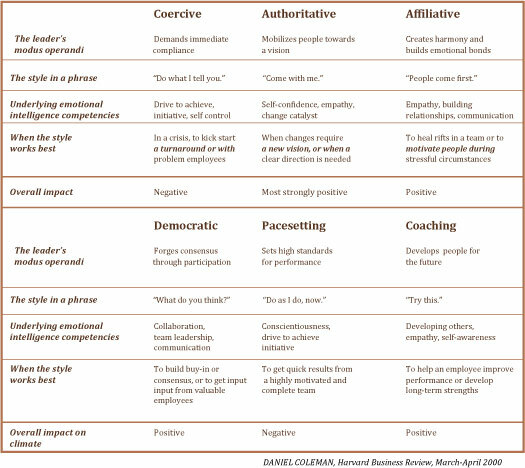 Within the past two years the consulting firm of Hay McBer examined leadership styles that appeared to have a direct and unique impact on the working atmosphere of organizations. This new research took a random sample of 3,800 executives worldwide. It showed that leaders who achieve the best results do not rely on only one leadership style, but use a number of different styles in any given week, seamlessly and in different measures, depending on the situation. The coercive style is the least effective in most situations. The leader’s extreme top-down decision making kills new ideas on the vine and results in very little flexibility to move ideas up. The coercive style has damaging effects on rewards systems because most high-performance people work for more than money – they seek the satisfaction of a job well done – while coercion erodes pride. Nevertheless, there are times when a coercive style can be useful – for example, in an emergency situation or a situation calling for a quick turn-around. Even so, this style should be exercised with extreme caution and not on a regular basis. The authoritative style is viewed as the most desirable of the six styles, primarily because its effect is to improve almost every aspect of an organization’s climate. Hallmarks of this style are vibrant enthusiasm and clear vision. Authoritative leaders are visionaries who motivate people by making it clear how their work fits into the larger vision for the organization. They maximize commitment to the organization’s goals and strategy by framing individual tasks within a grand vision. Authoritative leaders define standards that revolve around that vision. Performance feedback is provided, whether good or bad; the singular criterion is whether or not that performance furthers the vision. Standards of success are clear, as are rewards. Authoritative leaders give people the freedom to innovate, experiment and take calculated risks. This style works well in almost any business situation, but is most effective when an organization is adrift. There are some cases when this style doesn’t work, however. It is rarely successful when a leader is working with a more experienced team of experts or peers. Although this style is the one most employers describe as desirable, it is possible for a leader to become overbearing if the authoritative style is used by itself. The affiliative style is the one most often used in charities, which have a ‘people come first’ way of thinking. The affiliative leader values individuals and their emotions more than tasks and goals, and strives to keep employees happy in order to create harmony among them. Fierce loyalty is a benefit, as this style tends to build strong emotional bonds that result in positive communications throughout the organization. Affiliative leaders give people the freedom to do their jobs in the way they think is most effective. This style also provides ample positive feedback, which has special potency because in most organizations feedback is only given at review time. Affiliative leaders are masters at creating a sense of belonging and are natural relationship builders. This produces a generally positive impact, which makes the affiliative style a good, all-weather approach. It is a good choice to increase morale and team harmony, to improve communication or repair a broken trust; but it is not to be used alone. Exclusive focus on praise can allow poor performance to go uncorrected; employees may perceive that mediocrity is tolerated. Although they often provide positive feedback, affiliative leaders rarely offer constructive advice on how to improve, leaving employees to figure out how to do so on their own. If overly relied on, this style can actually steer a group to failure. People need clear directives to help them navigate complex challenges. It is more effective when used in close conjunction with the authoritative style. Authoritative leaders state a vision, set standards, and let people know how their work is furthering the group’s goals. 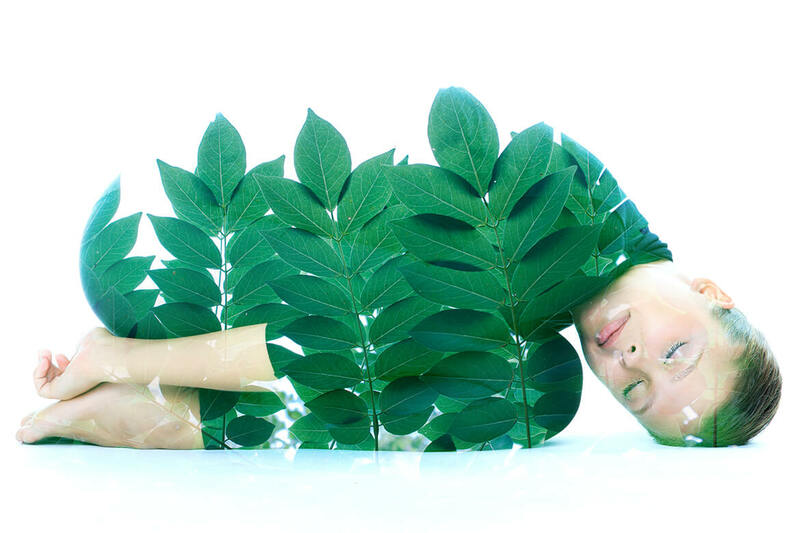 Added to the caring and nurturing approach of the affiliative style, it is a potent combination. The democratic style is seen most often at universities. Democratic leaders spend time getting people’s ideas and buy-in; and building trust, respect and commitment. Letting people have a say in decisions that affect their goals and how they achieve them drives up flexibility and responsibility. Drawbacks to this style include endless meetings in which ideas are mulled over and consensus remains elusive, often leaving people feeling confused and leaderless. This style works best when a leader is uncertain about the best direction to take and needs ideas and guidance from able employees. Combined with a strong vision, this style works well to generate fresh ideas for achieving goals, but it is not suited to times of crisis. The pacesetting leader sets extremely high-performance standards and exemplifies him- or herself. This type of leader is characterized by an obsession for doing things better and faster, and asking everyone else to do the same. They are quick to point out and replace poor performers, and to demand more from people. While job guidelines may be clear in the leader’s head, they are often not stated clearly. For employees, work becomes not a matter of doing one’s best along a clear course, but of second-guessing what the leader wants. Employees are not trusted to work in their own way or to take any initiative. The drawbacks to this style are the evaporation of flexibility and responsibility. People become overwhelmed by the pacesetter’s demands for excellence; morale drops. The pacesetting leader gives no feedback on how people are doing and is quick to jump in and take over when he thinks they’re lagging. Despite its shortcomings, however, this style can work well when all employees are self-motivated, highly competent and need little direction or coordination. This style is definitely not to be used by itself. The coaching style is the least used of the six styles, even though it works best for the long run. Coaching leaders help employees identify their unique strengths and weaknesses and tie these to their personal and career aspirations. They encourage people to set long-term goals and help them conceptualize a plan for attaining these goals. Leaders and employees make agreements about their roles and responsibilities in enacting plans. Coaching leaders give plenty of instruction and feedback, are excellent at delegating, and will put up with short-term failure for long-term gain. Leaders who do not include this style in their personal repertoire pass up a powerful tool that, because of its focus on personal development and immediate work related tasks, can have a positive impact on organizational climate and employee performance. Coaching improves results and guarantees that people know what is expected of them and how their work fits into a larger vision or strategy. Leaders need to employ many styles. Those who have mastered four or more — especially authoritative, democratic, affiliative, and coaching styles – are able to create a healthy climate and solid performance. The most effective leaders are those who can switch flexibly among leadership styles as needed. These leaders are sensitive to the impact they have on others and seamlessly adjust their style. Few leaders are comfortable with all six styles, however, and fewer know when and how to use them. In a continually changing business environment, synchronicity of leadership and management means knowing which style to use at what time and in what measure. Peter Drucker, world-renowned management consultant and author of the seminal work Managing the Non-Profit Organization, believes that the task of the manager is different from that of the leader. The manager’s task is to convert the organization’s mission into specifics. Management is more formal, scientific and, hence, universal. With its origins in the running of the household or some say, of army mule trains, management implies control backed by power and authority. Management tools and techniques are based on rational reasoning and testing across a wide range of business situations. Modern management applies four principles to all business situations — planning, budgeting, organizing, and controlling. Clearly, managing a nonprofit has many challenges that a for-profit corporation does not have to face. However, constantly learning new management techniques that are developed in for-profit corporations and adapting them to your organization will assist you to keep on the cutting edge. Planning involves determining what an organization is, where it wants to go and what alternatives exist towards that end, and identifying and shedding outdated and obsolete programs. Managers need to know a variety of planning models, not just the one that identifies a vision, mission, goals and objectives, strengths and barriers. This is true for both for-profit and nonprofit organizations, as both are experiencing significant and fundamental transformation. Traditional forms of measuring success have largely been focused on financial results. The Information Age demands that organizations develop new tools to measure performance. Organizations as diverse as hospitals, governments, social service agencies, and foundations have adopted a new comprehensive tool to meet these demands – the balanced scorecard. By linking strategy to operations, the balanced scorecard presents information in a way that the critical success factors identified by the organization can be monitored and evaluated. It translates an organization’s mission and strategy into a comprehensive set of performance measures that provide the framework for a strategic measurement and management system. Although financial objectives are still emphasized, the balanced scorecard measures organizational performance across four balanced perspectives: financial performance, customers’ knowledge, internal business processes, and learning and growth. Fundraising has become more competitive and demanding; more charities are requiring more dollars; and there have been a greater number of scandals in the mismanagement of funds in national nonprofits than ever before. The resulting pressure to use better business methods are reflected in a growing chorus of demands for more accountability and transparency in nonprofit operations. Meanwhile, the demand for innovative, educated, and effective nonprofit leaders is forcing many nonprofit executives (without adequate training) into a struggle with their boards to create dynamic visions and good strategic plans and build effective teams. Performance measurements are one area in which nonprofit organizations are particularly weak. Just as the corporate world needed to change how it measured and reported its activities, change is becoming increasingly important for nonprofits. Stakeholders are asking questions such as: What does the charity really do? What is the cost of their activities? What value do their activities give to individuals and their communities, and what are the outcomes of these activities? Managers should be aware of the principles involved in the balanced scorecard because business is quickly adopting this model. Budgeting is the planning process associated with an organization’s finances. If the leader’s role is to get results, then this is one of the most significant areas in which to do so – this is the bottom-line in most organizations. Knowing how to build and present your budget is a key role of any manager. The budget does not just detail the funds brought in, but also looks ahead to future investments the organization must make to remain efficient and effective – investment in technical systems or in staff education or retention, for example. Have you budgeted enough to keep the bright ones or to stay ahead of the competition? Many executives do not know the basic figures about their organization: how many donors do you have, what is the cost per dollar raised, how much is being raised this month or this quarter, what are your expenses? Organizing is the establishment of and adherence to formal structures within which the organization can accomplish its plans. It is process-oriented and deals with resource allocation and reallocation. Authority and responsibility are integrated with a view to carrying out the organization’s plan. Interpersonal relationships play a large part in the organizing process – the largest portion of resources, generally, is allocated to the people who will carry out the organization’s plan. This is the area in which true leadership is demonstrated. If you are not organized, you risk being replaced by a manager who is. Poor organization skills are often perceived as ineffective leadership. Controlling provides a link to the planning process and answers the questions: “Did we achieve what we set out to do? Were our objectives met? Have we ensured the effective and efficient use of resources?” Managers must watch constantly for deviations from the plan (problems) and use formal authority to solve them. Controlling includes designing work plans, setting up milestone charts, reviewing progress, scheduling, and appraising performance. Do you want to be the leader of a nonprofit organization, the manager, or both? It’s your choice. But between making that choice and achieving the desired end lies experience, people, learning, reflection – and a lot of unknowns. Most leaders in any field have had a number of career experiences. Some choose to stay within a certain sector, such as education, health, international aid, or the arts, while others move around. Staying in one sector offers the chance to develop a depth of knowledge of that specific sector’s needs, structure and players. A word of advice: whatever sector you choose, have a passion for it. Stay at the job – learn by your successes and failures, but stick with it. To become a leader, you have to learn a lot about yourself. That can be scary. We all have a strong tendency to get into a groove. Sometimes that groove becomes a trench, and when you are in a trench, you look only in one direction. Sometimes the trench fills up with dirt, which makes it is difficult to see over the top. It can take courage to ask someone to dig you out and point you in a new direction. In becoming a leader, there are a lot of unknowns. These are often circumstantial and situational. There may be job opportunities you never thought about; the job you finally got may not turn out to be quite what was described; you may not be hired for the job you really wanted; you may want a job in another city and your spouse won’t move; you may have just taken a position when the job you coveted for the last three years finally opens up; you may be fired. As a leader you will be faced with many decisions. The choices are yours. Now that you know what it takes to be a leader and a manager, and the synchronicity of the two, you have to identify what you need to add to your leadership styles and your management duties. To become a leader, you have to be experienced and collegial, open to learning and reflective and willing to face the unknown with courage. You also know that it is a choice that only you can make. Set a path, take every opportunity to learn and believe in yourself – and you will be a great leader and manager. Kaplan & Norton.The Balanced Scorecard (Cambridge, MA: Harvard Business Press, 1996), p.2. Murgatroyd, & Simpson, Making Measurement Work, Using a Balanced Scorecard in Nonprofit Organizations, p.7. A product of the AXIA Performance Centre.